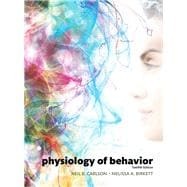 by Carlson, Neil R.; Birkett, Melissa A.
Physiology of Behavior provides a scholarly yet accessible portrait of the dynamic interaction between biology and behavior. Lead author Neil Carlson and new co-author Melissa Birkett drew upon their experience teaching and working with students to create the new edition of this comprehensive and accessible guide for students of behavioral neuroscience. In addition to updated research, the Twelfth Edition offers an updated art and visual program and a more robust learning architecture that highlights key concepts, guiding students through the text. Physiology of Behavior, Twelfth Edition is also available via REVEL™, an immersive learning experience designed for the way today's students read, think, and learn. Neil R. Carlson pursued his undergraduate studies at the University of Illinois. He had planned to study nuclear physics, but when he discovered in an introductory psychology course that psychology was really a science, he decided that was what he wanted to do. Before changing his major, Carlson talked with several professors and visited their laboratories, and when he saw what physiological psychologists do, he knew that he had found his niche. He stayed on at Illinois and received his Ph.D. Then, after a two-year postdoctoral fellowship at the University of Iowa, Carlson came to the University of Massachusetts, where he’s been ever since. When he arrived at UMass, Carlson established a laboratory where he investigated the role of the limbic system in species-typical and learned behaviors, continuing work he had done at the University of Illinois. He received several Biomedical Research Support Grants and a research grant from NICHD. As he became more involved in textbook writing, Carlson began to focus his attention more and more on this activity and on his teaching. Carlson retired from UMass in the fall of 2004 but continues to keep up with developments in the field of behavioral neuroscience and to revise his book. The Psychology Department has kindly let him keep an office at the university, which makes it easier for him to continue interacting with his former colleagues. Carlson’s interests outside of writing include spending time with his family, traveling, fly fishing, skiing, and flying his small airplane. As an undergraduate psychology major at Cornell University, Melissa A. Birkett discovered courses in biopsychology, behavior, endocrinology, and evolutionary psychology. There, she was introduced to interdisciplinary research incorporating multiple perspectives in the challenging task of understanding behavior. She became interested in learning about behavior and its underlying mechanisms. She worked as an undergraduate research assistant in several laboratories on projects ranging from insect behavior to sleep in undergraduates. Those formative experiences and interactions with several influential research mentors convinced her to pursue a career in research. Melissa completed her PhD in the Neuroscience and Behavior program at the University of Massachusetts Amherst (where Neil Carlson was a faculty member at the time). While there, she received training in visual neuroscience and psychopharmacology. Her interest in neuroscience and behavior grew to encompass the importance of effective teaching and pedagogy and she concurrently earned a master’s degree in science education. In 2007, she accepted a faculty position at Northern Arizona University in the Department of Psychological Sciences. Melissa currently conducts research related to the stress response and teaches undergraduate and graduate courses in neuroscience, psychopharmacology, and the teaching of psychology. Each semester, she supervises student researchers and seeks to provide them with the kinds of opportunities she found valuable as a student. Her work has been recognized with awards for both outstanding teaching and teaching innovation, and she has contributed to several publications on best practices in teaching neuroscience. Melissa is excited for the opportunity to contribute to the twelfth edition of Physiology of Behavior and hopes that this text continues to engage new students, introducing them to this fascinating interdisciplinary field.